Wih the recent national election, it is unclear if solar energy tax credits will continue to receive support in Washington. Claims there will be major changes in the tax code could quickly impact the solar tax credit. Act soon to guarantee you get a tax credit for your solar electric system in 2017. After 40 years in the solar energy industry, Mike Arenson is reducing his hours, working on selected projects, such as custom off-grid systems, grid-tie PV system upgrades, and consulting on business development in the solar industry. He is no longer selling directly for Solar Technologies. Mike Arenson is pleased to announce that he is now working and selling residential and small commercial PV systems for Solar Technologies. The longtime solar company has more than 1600 solar installations in the Bay Area. They started in Santa Cruz in 1998 and have offices here and Walnut Creek. "I am happy and proud to be part of such an experienced company with such a capable and enthusiastic group of people," Arenson said. "I look forward to being able to provide the best clean energy solutions for my customers working with Solar Technologies." Arenson will continue to support existing customers through qualified contractors when they need services, such as solar panel cleaning, inverter repair or replacement and system diagnostics. After nearly 15 years of providing cash incentives for solar electric systems, the rebates in California's PG&E utility territory have ended. Click here for the announcement. Rebates are still available to customers in other utility areas, such as SDG&E and SCE. The rebates were originally offered to stimulate the market for PV systems. Starting at $3.00/watt CEC-AC in 1998, the rebate grew to $4.50/watt during the energy crisis in 2000, then gradually dropped to $0.20/watt this year. More than 100,000 homes and businesses have added solar to their rooftops and properties since the incentive program began. 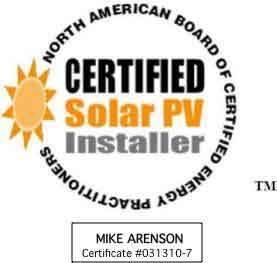 Mike Arenson has been recertified as a PV Installation Professional through the North American Board of Certified Energy Practitioners (NABCEP). This organization is the most respected, well-established, and widely recognized certification organization for North American solar professionals in the field of renewable energy. 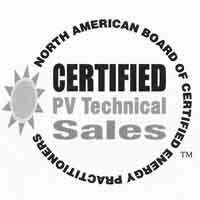 In addition to the PV Installation Professional certification, Solar Mike earned the NABCEP PV Technical Sales certificate in 2011 and passed the PV Entry Level Exam in 2008. Five students from previous Ohlone College solar design and energy classes, including three from Solar Mike's class last semester, talked about their new jobs and experience in the solar industry. They also gave advice on how to succeed. Traits and skills they thought were essential for salespeople included: having a thick skin, being able to bounce back, being positive, good verbal and people skills, perisistence, asking questions, and continuous learning. Solar entrepeneur Joe Davis said "To stay current I read solar news online every day." 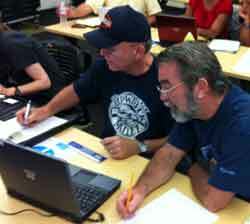 Energy specialist Patti Sexton recommended taking free classes at PG&E's Energy Center. "They are excellent," she said. Solar Mike will again be teaching "Solar Sales and Design Training" from Feb 5 through March 14, 2013 at the Newark, CA campus of Ohlone College. The six-week class meets twice a week, and will help prepare qualified participants for sales careers in the PV industry. More information is available. Solar Mike gives public presentation in Permaculture Class at Cabrillo College. Room 5010. Noon - 2:00 p.m. Solar Mike will be giving a 2-hour presentation on basic solar design principles for homes, buildings, and energy production. The presentation is part of the college course "Introduction to Permaculture" led by Ken Foster, of TerraNova Ecological Landscaping. The Cabrillo College Horticulture Department has a deep history in teaching permaculture concepts and practices. The Santa Cruz Sentinel featured Ohlone College students in an article about their Solar Sales and Design Training class taught by Solar Mike. Headlined Betting solar energy will take off: Career changers thankful for federally funded classes, the article talks about job opportunities in the changing solar industry and how the sales training class can help land those jobs. The U.S. Commerce Department made a preliminary ruling today on tariffs on Chinese solar panel imports. They said Chinese producers have dumped solar cells and panels in the United States at margins ranging from 31 percent to nearly 250 percent. If the preliminary ruling is upheld, tariffs averaging 31 percent could be imposed. A final ruling will be made in October. Once the DOC has published its final decision on tariffs, the International Trade Commission will review the decision and will issue its final injury ruling in November. Solar Mike expects there will be immediate and midterm price increases for residential and large solar projects. Solar panel costs represent approximately 25% of the total cost of a residential solar installation. If the tariffs are applied at an average increase of 31%, it could increase the cost to the customer proportionally. Solar electric system prices, which have been selling for $5 or $6/watt, may rise by 10 -15%. Examples of chinese solar panel manufacturers which may be subject to the tariffs, which Solar Mike sells, include Canadian Solar, Suntech, Trina Solar and Yingli. Other solar panels which are sold by Solar Mike, such as Sunpower, Schuco, Sharp and REC, are not subject to the tariff. Arenson Solar is now selling the highest efficiency PV panels on the market. They are made by Sunpower and manufactured in Silicon Valley. These panels are ARRA compliant. During the period between March 15 and April 30th, we have reduced the price of these SunPower panels. This offer is only available for cash transactions and is not available for the SunPower Lease program. The panels are built to order and thus have a lead time of eight weeks from the time we receive your order. High school students in the San Lorenzo Valley learned about being a solar energy specialist and a dozen other careers at the SLVHS Science Night led by teacher Jane Orbuch. Solar Mike was interviewed by several teams of students prepped with career questions and pumped to explore occupations that use science. When asked what the favorite part of his job was, Solar Mike mentioned the satisfaction he gets from seeing solar projects he's worked on generating renewable power in Santa Cruz and aroud the Bay Area. You may have noticed how the price for PV modules has plummeted the past few years. This is due to a number of factors, including a fall in the price of silicon (the major processed material for solar modules), unstable markets for PV in Europe, and many Asian manufacturers entering the market. There has recently been talk in Washington DC of establishing import duties on Chinese PV modules, as some companies have claimed that China provides its solar industry with unfair financial support. In a preliminary decision, the International Trade Commission found that Chinese imports are hurting the U.S. solar industry. The companies allege that Chinese manufacturers are illegally dumping solar products into the U.S. market, or selling panels below cost in order to put international competitors out of business. They claim that the tactic could reduce competition and eventually lead to a Chinese monopoly on solar. Solar Mike has been talking with a number of solar equipment distributors the past couple months, and they all are suggesting that due to tariffs or threats of tariffs, prices might be going up 2Q 2012. Working in partnership with leading solar manufacturer Sunpower Corporation and SunsUp Solar, Solar Mike is now offering leasing of solar electric systems to customers in the Bay Area. More than half of all residential solar electric systems installed in California today are using these lease options. Instead of buying and installing solar panels yourself, the customer can sign up with Sunpower to build, own and maintain the solar electric system. The customer pays Sunpower a certain amount each month, and also pays the utility for whatever extra power is needed, if needed, from the grid. The systems will include the most efficient solar equipment, Sunpower E18/19 series PV panels. These solar panels are 25 - 50% more efficient than most others. Contact Solar Mike for a free consultation. Voices from The Village Community TV broadcast entitled Eco-Crisis Part 2, looking at the role of renewable energy in mitigating environmental impacts of energy use. Hosted by David Stearns, with guests Mike Arenson, and Ray Newkirk of the BioFuels Station. During the discussion Arenson said, "What I see happening in the US is that the media has such a strong influence on public opinion about what might be going on with climate science. The average citizen has got to look for themselves to find out what's the real information here, rather than what's the current media hype." Reskilling Expo with Solar Mike on Solar Water Heating, talk at 11:30 a.m.
Reskilling Expo at Museum of Art and History, Santa Cruz, CA. Solar Mike will be describing low-cost ways to heat water using solar energy with a focus on batch and thermosyphon type solar water heaters. He will show techniques for the design and construction of solar water heaters, emphasizing low-tech designs and equipment. His talk is part of the Reskilling Expo at the Santa Cruz Museum of Art and History. This is the second time Arenson has presented this topic with the Reskilling Expo. "Solar water heating is the unsung hero of solar energy," Arenson lamented. "The basic principles of their design and construction are accessible to almost anyone," he explained, "but almost no one does it." At the Reskilling Expo, Arenson will show examples of solar water heaters, explain how they operate and how to construct them. "The essential equipment is a 40 gallon tank, an insulated box and glass. It is not difficult to heat most of your home's hot water with low-tech solar," he said. Arenson is no newcomer to the solar industry. "I built my first solar water heater more than 30 years ago," he said. This year marks his 35th year working in the solar energy industry. 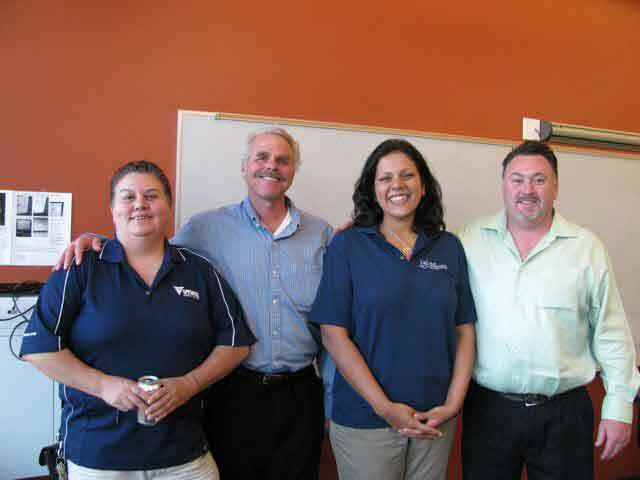 Arenson has had an extensive career doing solar design and construction, and teaching people about solar energy. He has designed hundreds of solar power systems, and sold nearly 10 million dollars in solar projects. Electric vehicles have long been popular with Solar Mike's customers, including the GM EV1 and Toyota RAV EV. Recently, two of the latest entries in the EV market have made their local appearance: the Chevy Volt and Nissan Leaf. The Volt includes a gasoline engine, which gives it extended range, while the Leaf is all electric. Either car can be charged by solar power. Solar Mike has several new customers who have ordered the EV's, or are planning to get one soon. Meet at Greenspace in Santa Cruz on Sunday afternoon for a presentation on solar cooking. Solar Mike has been building and using solar cookers for more than 30 years. He'll explain how to build your own cooker and use the Sun Oven to cook your favorite foods. A new research report by the U.S. Department of Energy (DOE) Lawrence Berkeley National Laboratory finds strong evidence that homes with solar photovoltaic (PV) systems sell for a premium over homes without solar systems. The research finds that homes with PV in California have sold for a premium, expressed in dollars per watt of installed PV, of approximately $3.90 to $6.40/watt. This corresponds to an average home sales price premium of approximately $17,000 for a relatively new 3,100 watt PV system (the average size of PV systems in the Berkeley Lab dataset), and compares to an average investment that homeowners have made to install PV systems in California of approximately $5/W over the 2001-2009 period. The Berkeley Lab research is the first to empirically explore the existence and magnitude of residential PV sales price impacts across a large number of homes and over a wide geographic area. The research analyzed a dataset of more than 72,000 California homes that sold from 2000 through mid-2009, approximately 2,000 of which had a PV system at the time of sale. This week marks the 35th year that Mike Arenson has been working in the field of solar energy. A large celebration is planned for later this year, hundreds are expected to attend. 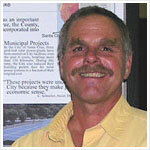 Mike got his start in solar energy in 1976, working as a writer and editor for the Santa Cruz Alternative Energy Coop. He apprenticed with solar pioneer Steve Baer at Zomeworks Corporation in Albuquerque New Mexico. He was an alternative energy editor for the NASA Technology Application Center, an instructor in solar energy at Cabrillo College, and founder of the non-profit Rising Sun Energy Center. In 1998, Mike began selling solar electric systems to homeowners and businesses. He has worked with top solar builders and engineers at companies including Carmanah Technologies, EcoEnergies, Independent Energy Systems, Full Circle Solar, Pacific Solar Company, REC Solar, Solcon Solar Construction and Zomeworks Corp. He operates his own solar design and sales company, providing services throughout the Bay Area and US. Mike Arenson has passed a rigorous national exam in technical sales of solar electric systems. Fewer than 100 people achieved a passing score on the inaugural sales exam recently offered by the North American Board of Certified Energy Practitioners (NABCEP). According to NABCEP, individuals who pass the PV Technical Sales examination demonstrate extensive knowledge of the complex range of activities that make up a successful photovoltaic (PV) sales process. Those who are certified as PV Technical Sale Professionals will be able to provide the highest level of ethical, accurate presentations of a proposed PV systems' electrical, financial, and environmental performance projections. Arenson has 35 years experience in the solar energy industry. He moved into solar sales 15 years ago, following an extensive career doing solar design and construction, and teaching people about solar energy. He has designed hundreds of solar power systems, and sold nearly 10 million dollars in solar projects, many of which have been built in Santa Cruz County and the San Francisco Bay Area. In the last three years his business has expanded nationally and internationally. He has consulted on projects in New York, Texas, Costa Rica, Mexico and India. His latest project is helping develop a $50 million solar farm in the southwest. NABCEP is the most widely recognized national certification organization for professional installers in the field of renewable energy. Their mission is to develop and implement quality credentialing and certification programs for practitioners by supporting and working closely with professionals and stakeholders in the renewable energy and energy efficiency industries. To learn more visit www.nabcep.org. Solar Mike to speak at San Lorenzo Valley High 6:30 - 8:30 p.m.
Local environmental business and industry leaders will be meeting SLV High School students who have been studying envionmental monitoring. 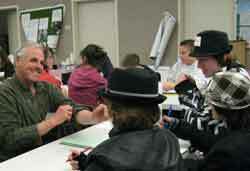 The popular Science and Careers Night will be held in the SLVHS Multipurpose Room in Felton. Solar Mike will be discussing career opportunities in solar energy, and ways that monitoring plays a key role in the value and performance of solar energy systems. He will be demonstrating remote monitoring of recent solar installations. A new tech hub has moved into the heart of downtown Santa Cruz. Operated by Cruzio, the internet service provider, and shared with Ecology Action, the renovated building has LEED certification and many green features. Solar Mike will be sharing workspace with tech start-ups and other businesses. Contact Mike beforehand if you'd like to arrange a meeting with him at the new coworking space. The EcoGreen Group in Silicon Valley is hosting a Sustainability Forum on Bridging the Energy Gap. Solar Mike will speak on the potential and opportunities for solar power. The event will be held Tues., Oct 19 from 5:30 to 8:45 p.m. at Cisco Systems, Building O, 10 West Tasman Drive, San Jose, CA. Solar Mike will be speaking with environmental engineer Peter Haase at the Cabrillo College Horticulture Lecture Series on the topic of Home Scale Solar and Water Solutions for Suburban Sustainability, 7:00 to 8:30 p.m., room 5005. The largest US solar power conference happens this week at the LA Convention Center. Solar Power International 2010. "The absolute best solar show in the country," says Solar Mike. The Santa Cruz Sentinel has reported that a new program called Energy Upgrade California will soon be in to effect to provide financing for residential solar projects. More information forthcoming. The California Public Utilities Commission (CPUC) today authorized the use of tradable renewable energy credits (TRECs) for use in the California Renewables Portfolio standard (RPS) program. The CPUC's RPS program requires utilities in California to obtain 20 percent of their retail sales from renewable energy sources by 2010. RECs are a certificate of proof that one unit of renewable energy has been generated and an accounting tool used to prove that electricity sellers have complied with the RPS program. In today's decision, the CPUC established the structure and rules for a TREC market. The rules approved create a market in which tradable RECs can be used for for RPS compliance for given investor-owned utility's annual procurement obligation. Today's decision also allows tradable RECs from existing RPS contracts to be unbundled and sold under certain conditions. The framework includes an interim price cap of $50 on RECs used for RPS compliance by investor-owned utilities.The price cap will sunset at the end of 2011 unless action to retain or modify it is taken by the CPUC. In New Jersey, RECs have been traded for more than 10 times the California price cap of $50 per REC. If the TREC market is extended beyond 2011, the value of the TRECS may become more significant than the state rebates and federal tax credit, combined. A complete version of the press release can be found at the CPUC website. As reported in the Santa Cruz Sentinel, "Santa Cruz resident Mike Arenson has received the North American Board of Certified Energy Practitioners' solar photovoltaic installer certificate. The owner of Arenson Solar, he was among 287 people to pass the exam in March. Arenson has more than 33 years experience working in the solar energy field." 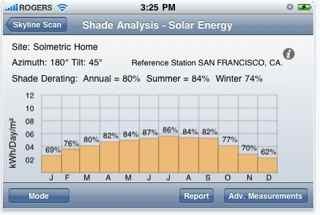 Software specialist Andrew Mackenzie had a great idea last year, when he developed a handy application for Apple's iPhone, which calculated the effect of shading on a solar electric system. Selling for just $15, it was the lowest-cost solar design product on the market. It didn't take long for Solmetric, developer of the SunEye solar site analysis tool, to acquire the app, and rebrand it under their own name as the SolmetricIPV. It sells for $30. Although the price doubled, it is still much less expensive than the SunEye, which retails for about $2000. Solar Mike downloaded the app as soon as he heard about it, and thinks it works great. Available from Apple's iTunes store. Worth a try. The California Energy Commission has announced a grant that will fund the administration of an innovative loan program for solar and energy efficiency projects. Homeowners and businesses will pay for the loan through an assessment on their property taxes. The debt will stay with the property if the property is sold. The solar financing program will be available in 14 counties, including Alameda, Fresno, Kern, Monterey, Sacramento, San Benito, San Diego, San Luis Obispo, San Mateo, Santa Clara, Santa Cruz, Solano, Ventura, and Yolo County. Read more about this as reported in the Santa Cruz Sentinel, or at PACE program funding. Selected California customers received a letter from Pacific Gas and Electric Customers (PG&E) explaining new options for selling solar electricity to the utility. Existing solar net metering customers are now eligible to receive compensation for electricity they generate beyond their annual consumption, meaning customers will actually get paid for all the excess solar electricity they generate. Popularly known as AB920, (Assembly Bill 920 - Huffman - Solar and Wind Generation), the landmark bill was signed by Governor Schwarzenegger in 2009. 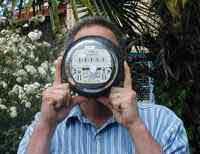 In a letter to their solar net metering customers dated 1/29/2010, PG&E wrote "If you provide more energy to PG&E's electric system than you receive on a 12 month basis, you would be identified as a 'net generator'. As a result, you would have the ability to receive a once-per-year compensation for the excess electricity you supply to the PG&E grid. Starting in 2010, this compensation will be calculated at the time of your normally scheduled, annual true-up. The California Public Utilities Commission (CPUC) still has to determine the details before [full] implementation." Updates may be available at PG&E's solar webpage, or by contacting their Customer Service Center at 1-877-743-4112. The California PUC is launching a Solar Thermal Incentive Program, to stimulate the market for solar water heating in the state. The incentives are paid up front based on the estimated first-year therms displaced, and incentives decline in four steps based on program participation. Details forthcoming from the CPUC CSI Thermal Program . Solar Mike helped prepare students in the Solar Richmond job training program for their first job interviews. Mike emphasized "Be prepared, be brief and be clear" when making that first call for a solar job. Solar Richmond offers a pre-apprenticeship program that provides job training and work opportunities in solar energy.